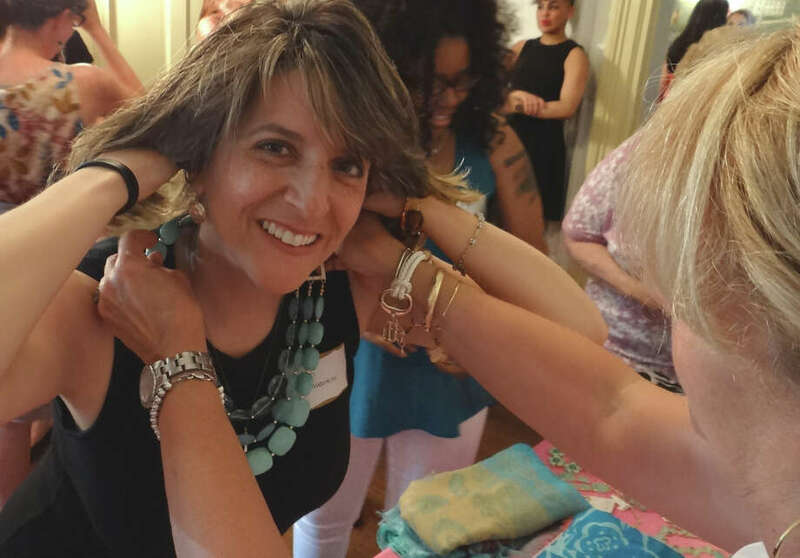 Karen Guastelle of Fairfield tries on jewelry by Jenny Boston at the Junior Women's Club of Fairfield's Ladies Night Out event on Thursday. The historic Burr Homestead has hosted many a social event over the its long history, and Thursday evening it mansion as transformed once again -- this time, into a stylish venue for "Ladies Night Out" fashion and salon event hosted by the Junior Women's Club of Fairfield. The event featured spa services -- including makeup applications, waxing and hair extensions -- in each of the rooms on the homestead's main level, as well as a fashion show complete with runway and a disc jockey spinning tunes. Both children and adults served as models, showing off spring and summer fashions. "The primary focus of our event is a membership drive," said Meghan McCloat, the club's membership vice president. "Our organization is geared to women ages 18 to 60 and we are about community service. Main annual events include Touch-A-Truck at Fairfield Ludlowe High School, Santa's House at the Burr Homestead and the townwide Spelling Bee competition. We're always looking for helping hands to help make our community events better." Over the years, the Junior Women's Club has given more than $350,000 in donations to such local groups as Burroughs Community Center, Fairfield High Schools Scholarships, Mercy Learning Center and Operation Hope, among some two dozen beneficiaries of funding. Through its many service projects and activities, the club gives members opportunities for personal enrichment, leadership experience, community connection and social interaction. Fairfielder Jen Hinkle has been a club member for the past 15 years. "This is an amazing group of women, from all different professions and ages," she said. "I have made many friends through the group that I would never have made otherwise. Besides the camaraderie, the club gives you the chance to set an example for your children about community service within and outside of the area. The initial slogan that attracted me was Friendship Through Service, which is what we're all about, as we also take care of each other." The club's "fundraisers have become family traditions in Town and have welcomed generations of people," she said. In the past, social events have included a monthly book club, movie nights, potluck dinners and a family beach picnic.